Last Friday we had fun hanging out with our friends at the park. We packed a lunch, set up at one of the picnic tables, and the kids ran, played, jumped, climbed and played with water guns. Several of my readers have asked how Mike is doing with his cold. He's actually been out of town all week on a business trip ... and he's still sick. I think he's feeling a little better, but I know how hard it is for him to be away from home and not feeling well. He'll be home tonight so we can give him extra special care, hugs and kisses. He tested negative for strep and does not have an ear infection. Just a cold. He still didn't have an appetite yesterday. That's two days in a row that I've barely gotten him to eat anything. The doctor said his throat is/was very sore and that's probably why. He won't even eat macaroni and cheese ... and that's his favorite food! I'm really hoping he feels better today and will eat a little something. Even though he's sick ... he's still going a mile a minute. We haven't been anywhere in 3 days (except for the doctor). He and I are both getting a little stir crazy. We were invited to our friend Leah's house to day for a pool playdate but I had to let her know we weren't going to be able to make it. We would LOVE to be there ... but I do not want other kids to catch what Griffin has. He's still sleeping this morning ... 6:45 ... that does his little body good. Hopefully when he get's up he'll be feeling much, much better. Mike came home with a cold and Griffin caught it immediately. Sunday was a day of rest at our house. They were both so sick ... coughing, body aches ... it was not good. Mike went to work ... still sick. Griffin is still not feeling well either. He hardly ate anything at all yesterday. He went down for the night at 5:30 pm. If he's not feeling better today then we are going to take a trip to the doctor. We have a couple of planned playdates, but it looks like we may have to cancel them both. They had many fun things for the kids to do and lots of good homegrown things to bring home with us. Griffin checks out the produce in one of our favorite stands. Snuggling up with a furry friend. If Mike was not severely allergic to cats ... this little guy may have found his way home with us. A little girl made these adorable Bug Catchers ... we thought this was a great way to catch fireflies and bring them inside for a little while. And a little homegrown goodness. I can't wait to bake the garlic in olive oil, mix it with some butter and then serve on some sour dough bread. That's a Paula Deen recipe by the way. I love going to the Farmer's Market ... we're definately going back soon. We are very, very, very proud of you!!! I picked up my new glasses yesterday ... I think I like them. Taking pictures of myself felt pretty strange. This is a picture of my new regular glasses. Okay ... so in this picture you can really see my freckles, age spots, wrinkles and makeup-less free face. I'm 40 ... need I say more? I wanted to show a close up of the fancy swirly design on the side of the glasses. And this is my sunglasses! It felt sooo good yesterday to put my sunglasses on while I was driving. I could see and the glare was gone. I have pretty sensitive eyes and it's nice to be able to drive without squinting because of the glare from the sun. And another close up of the side ... this pair has a swirly fancy design too. I hope you all have a great Saturday! Mrs. Grossman's Charm City Cake Stickers. Oh my goodness ... will you just look at these stickers???? Mrs. Grossman's has teamed up with Charm City Cakes to create a new line of stickers inspired by the bakery! How absolutely COOL is that? I love the Foodnetwork Show Charm City Cakes and I've been a Mrs. Grossman's fan for over 10 years!! I've actually taken a class with Mrs. Grossman as the instructor before. Does anyone remember Paper Potpourri in Lakeland? I was lucky enough to attend one of her sticker creation classes there. She was just lovely. I also learned a nifty trick from her. If you want to add a sticker to say a card and you want it to hang over the edge a little bit ... just dust the part that hangs over with a little baby powder to take the stickiness away. Clever huh? Also ... you know on some of her stickers there's a little area in which you have to remove a tiny little part of sticker to just have the actual shape ... like on the middle of a tea pot handle for instance. She calls those little trash parts of the stickers "dams" ... as in dam I can't get it off. Hope not to offend anyone with that ... I just thought it was cute and something I remembered from her class. When my sister and I and our husbands owned our own scrapbooking store in Florida ... we carried Mrs. Grossman's entire sticker line on the rolls. Remember back in the day when the only scrapbooking embellishments we had to choose from was Mrs. Grossman's stickers and die cuts? Boy ... the scrapbooking industry has come a LONG way as far as embellishments and such. If you are interested in seeing the entire Charm City Cake sticker line then click here to see them! Also ... did you know you can order stickers directly from the Mrs. Grossman's website too? I didn't know that!! I remember when you could only purchase her stickers from a local scrapbooking store or another online retailer like Gentle Creations. I think it's great we can purchase them directly from the Mrs. Grossman's company. Have you ever seen that Chevy Chase movie called "Groundhog Day"? In the movie Chevy Chase's character leads the same day over and over and over again. Sometimes when I'm blogging I feel like it's my very own version of Groundhog Day. We seem to do the same things over and over and over again. And while it's fun for us ... I'm pretty sure my blog readers get tired of hearing about our visits to this place or that place repetively. So today ... I have nothing to blog about. I thought I would share this picture of a rainbow I took the other day. Although the rainbow looks very faint in this picture, it was one of the brightest ones I've seen. You could even see the violet color ... something we have rarely seen. And, it was a double rainbow. It was just gorgeous! I wish I could have captured it's beauty on camera. I'm a little mad a myself this morning ... I forgot to grind my coffee beans and start my automatic drip coffee timer last night. I so enjoy getting up and having my coffee ready. It's almost 6:45 and I can't start my coffee yet! Griffin is sleeping in and if I grind the beans it will wake him up. So, I will have to wait for my much needed coffee. Hopefully this isn't a premonition of the kind of day we are going to have. After Mommy & Me yesterday we had lunch at the Chinese Restaurant with our good friends Keisha, Darren (her husband) and Darius. After lunch we decided to drive to Short Pump for dessert. A couple of weeks ago I had spotted this cute sign as I was driving by. The name of the store is Two Sweet Cupcake Boutique. We thought that would be a great place to get a yummy cupcake for dessert. Well, we got there ... and they are still under construction. They will be open soon though. Since we were in town we decided to stop by Target and then go into Kroger for cupcakes. Two good friends ... Griffin & Darius. And finally ... some cupcake yumminess!! It's good to know the Two Sweet Cupcake Boutique will be open soon ... another reason to take another field trip! The other day I mentioned I was going to make Jambalaya for dinner. My friend Jen emailed and said she had never heard of it before. So, I thought I would share a picture and a link if you would like more information about it's origins. Even though I start with a box, I still consider it "homemade". The box consists of the rice and spices ... I add the meat ... hamburger, smoked sausage and shrimp. I also add another box of black beans and rice. It just gives it a little more "umpph". And I also add a can of Fire Roasted tomatos. Follow the directions and it cooks all together. Jambalaya is a one bowl rice dish ... it's yummy ... and hearty. It can also be spicy. That's why we do not have it very often because it's a bit too spicy for Griffin. Mmmmmmmm ... yummy! The version I make is probably more of the creole style because I make mine with tomatos. There is also a cajun style that's more brown than red. Make sure to click on this link to find out more if you are interested. And dinner is served ... it is so, so good!! One of Griffin's favorite things to do is to visit Mike at the airport when he has a flying lesson. He says he wants to "go see da air-panes". We haven't been in awhile so I decided to take him over there Saturday morning. 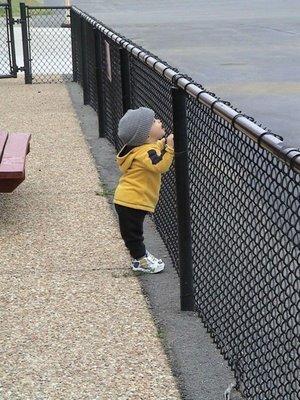 Griffin waiting patiently as Daddy is flying around. Does anyone else remember this picture of Griffin from October 2006? 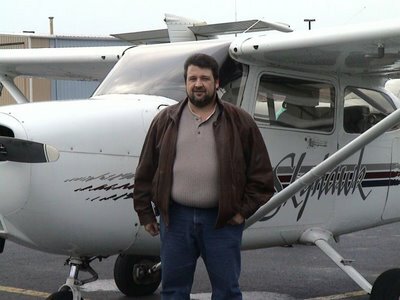 It was taken the day of Mike's first solo flight. I just love this picture. And look at this one ... almost the same exact spot two years later. My how he's grown! Mike and Griffin ... two fellas that love airplanes! I love that they have this in common. It warms my heart completely that Griffin has taken to his Daddy's love of flying. One day Mike and I will be there celebrating Griffin's first solo airplane flight. I completely missed blogging yesterday. I signed on to the computer and even resized my pictures, but then I signed off before remembering to blog. Friday we had a fun day with a party at the YMCA for our friend Carol's birthday! First Griffin and I had to make a stop by Walmart to pick up her birthday cake. When entering we discovered it was the day for Anthem's Lemon Aid stands around town. We were lucky enough to be able to enjoy some wonderful lemonade from The Children's Miracle Network. This is a picture of the "Lemon Aid Lady" and Al. They had the cutest set-up. Their lemonade stand was decorated Hawaiian style. They put cute little paper umbrellas in the lemonade drinks and gave everyone a lei. It was very sweet. I didn't take many pictures at the YMCA ... we were having way too much fun. Let's see who was there ... the birthday girl Carol, her daughter Sara and son Samuel. Cyndi, Harry & Jack ... Keisha & Darius ... Kristina & Zach ... Terri, Nadia & Anthony. It was really a great day with lots of fun, food and friends! And here is Griffin with one of his favorite people in the world ... Sara. I thought I would share some of my favorite tv shows right now. My favorites change from time to time ... but this summer this is what I'm watching. My pick to win? Lisa Garza! She's sassy and she can cook. I would like to see Twitch win. I remember he didn't make the top dancers on last season. He came back this season to try out again and made the top 20. Way to go Twitch. My favorite girl dancer is Katee. Mmmmmm ... let's see ... Matt Locke. LOL ... everytime I hear his name I think of Matlock the tv show from the 80s/90s. He's not only a good designer he's a carpenter as well. Hands down ... Melissa Lawson SHOULD win this competition. But I'm really torn because Gabe Garcia is a GREAT singer as well. So, hopefully we'll see the two of them as the last two standing and hopefully they will both earn recording contracts. This season just started and I've taped it on DVR, but I've not watched the first episode yet. I will get around to that soon. I seriously LOVE this show. At first I didn't think much of Kate but then I came to realize she HAS to act like that. I know how I feel sometimes with only one child ... she has EIGHT KIDS!! I love this show!!! Okay ... I'm not really sure why I like this show so much, but I do. Maybe it's the fact we get to see into the life of a celebrity that seems to act "real". And she's a Mommy. Another reason I like her. Yes, I think Tori Spelling comes off as spoiled sometimes ... but I think she is trying her best to live a happy life and provide for her children the best way she knows how to. First Griffin and I went to the 2nd Pre-School Playdate at his school. It's an open house type of event where the kids play on the playground and get to know each other. They also serve lunch ... hotdogs, chips, watermelon, etc. Griffin enjoyed the Snoopy shaped ice cream they had for dessert. After the Playdate we headed home and we both took a much needed nap. Mike arrived home about 3:30 and then he had to head out to meet his flight instructor Tom at his house. Griffin would have no part of Daddy leaving without him. So, Griffin and I went and we were going to drop Mike off and find something to do until he was finished with the meeting. As we were headed to Tom's house we drove right past The Playroom. I asked Mike to drop us by there and to come back to get us when his meeting was over. This was a great idea! After his meeting ... Mike came by to pick us up and we headed to Olive Garden for dinner. Oh my ... I had Grilled Balsamic Chicken ... over angel hair pasta with yellow and red tomoatos ... yummo!!! That's the second time we've been out to dinner this week. We rarely go out to dinner because Mike travels alot and he really gets tired of eating in restaurants. I must say, it was a nice treat though!! I'm going to surprise Mike with a favorite home cooked meal tonight. He's in Newport News today ... but he will be home for dinner. I'm going to make jambalaya ... double yum! I think that will make him happy!